Una Keeley is a professional MBSR Mindfulness Based Stress Reduction Instructor. She is the founder and owner of Mindful Create. Training Executives, Managers & Staff to De-Stress with Mindfulness Stress Reduction Skills. Una is a HSE approved Mindfulness Instructor, training HSE staff in mindfulness. (Irish Health Services Executive). She offers Courses & Workshops to the general public and the corporate sector.Una has been practicing meditation for 25 years. She Adheres to The Irish Good Practice Guidelines for Teaching Mindfulness-Based Courses. 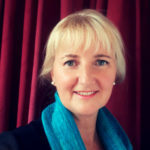 Una is a trained MBSR Mindfulness Instructor with the Institute for Mindfulness Based Approaches, IMA Germany. Una is currently working on a new body of paintings in her studio inspired by her practice and work as an MBSR Mindfulness Instructor. Images will be posted shortly.